Blowout Sale! Free Shipping Included! Save 71% on the DN2PVDG10-BRK Defender by Dendra at MZ Italia. MPN: DN2PVDG10-BRK. Hurry! Limited time offer. Offer valid only while supplies last. 5 1/4'' closed framelock. 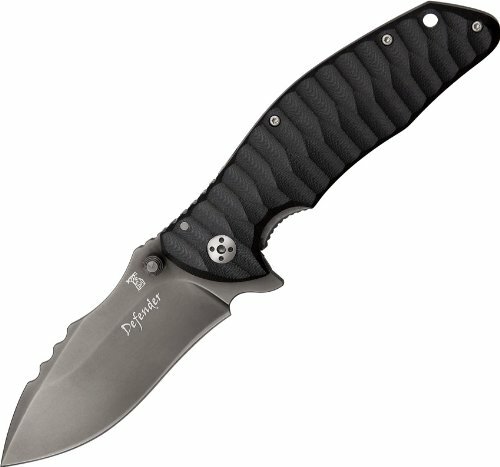 3 3/4'' black coated PVD finish D2 tool steel blade with wavy top edge, dual thumb studs, extended tang and thumb ridge. If you have any questions about this product by Dendra, contact us by completing and submitting the form below. If you are looking for a specif part number, please include it with your message.